of the beach as we cruised down the coastline. Signs that say "Troops Crossing" and "Tank Crossing"
malts. We, I mean, they, prefer to remain anonymous. forward to a fun evening. The other thing you missed is BCI getting "busted by Motel 6." Well…sort of, kind of. cyclists began to accumulate outside of the tiny motel office. to participate. I did and it was fun! strawberry/blueberry fruit salad along with a chicken dish for those who weren’t having pizza. She also made brownies with walnuts and chocolate chips for dessert. Everything was so delicious! I nominate her as the next "Food Network Star!" Peter Gerrard’s and Bob Ruris’ birthdays. Yes, 45. BCI folks broke out singing "Happy Birthday"
out with the pelicans and enjoyed the sounds of the surf. out…well…I’m sure you get the picture. laughed about our event getting "busted." We wondered what could have prompted the complaints. people, this isn’t American Idol! Give us a break! 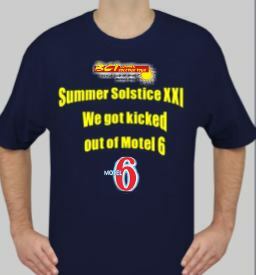 and hold our heads high should we return to Motel 6 next year. for another successful Summer Solstice. Wash and cut vegetables to a size from 1" to 2". Toss with olive oil and salt and pepper. Toss vegetables with all ingredients and salad dressing. Taste and adjust seasoning. and baked until crisp, about 15 minutes. Wash strawberries and blueberries - Dry fruit well. Zest 2 lemons and add zest. Chop fresh mint and toss thoroughly.